Always Dependable And Friendly I.T For You. Poor Backup Strategy, the seventh common small & medium sized business technology mistake, often proves irrecoverable. Despite numerous choices, methods and options, many organizations fail to adequately back up data. Statistics reveal there is a 50% chance an organization will cease operations immediately when critical data is lost. Worse, an organization’s odds of failure rocket to 90% within two years when critical data is lost. Data losses cost an average of 19 days’ productivity. Recovering data from damaged disks, meanwhile is incredibly expensive. 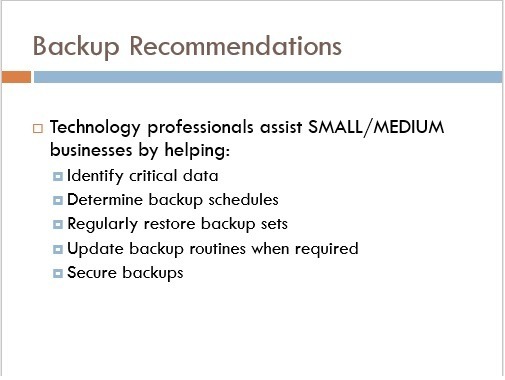 A Poor Backup Strategy can be fatal for a small or mid sized business. Even organizations that believe their data is properly protected may find themselves at risk. Occasionally incorrect data (as in the wrong data) is backed up. 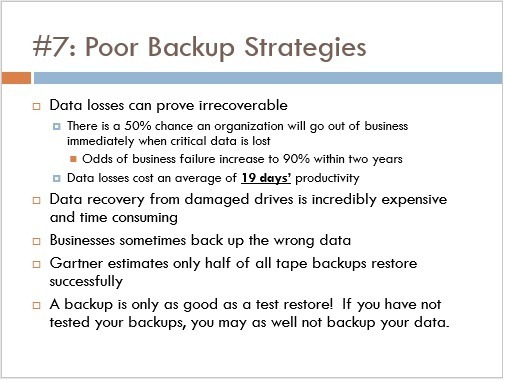 In other cases, tape backups prove unreliable (Gartner Group estimates only half of all tape backups restore successfully). Fortunately, small & medium sized businesses can follow simple steps to securely protect their data and get rid of a Poor Backup Strategy. should work with proficient IT consultants or technology partners to ensure the right data is being backed up and that it’s being backed up as frequently as required. In addition, technology professionals should regularly test backup sets to confirm the data can be recovered in its entirety. Consultants can work with small & medium sized businesses to determine what data, files and information should be backed up, how often to create the data sets, where to locate the backups and how often to test the sets’ integrity. Consultants also prove invaluable in updating backup routines when software upgrades, migrations and other updates change critical file locations. Further, technology professionals can ensure businesses’ data remains secure, which is a critical concern for physicians, financial institutions and even retail outlets. Copyright ServiceMyBusiness.com All Rights Reserved.